After an absence of nearly two decades, 2013 Select Football marks the brand's pigskin return. The high-end product has a Prizm makeover with every box promising four autographs and four Prizm parallels. 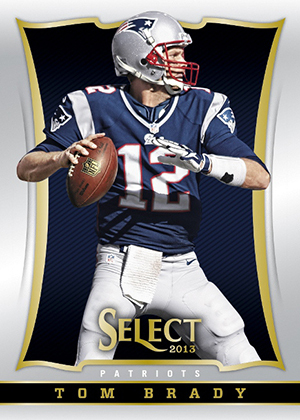 2013 Select Football is packaged with a mini box format. Each master box has a pair of seven pack mini boxes. 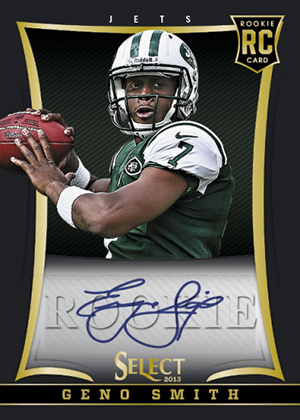 Leading the checklist are Autographed Memorabilia Rookie Cards from the 40 attendees of the NFLPA Rookie Premiere. Besides basic versions, there are Prizm, Gold Prizm and Black Prizm parallels. 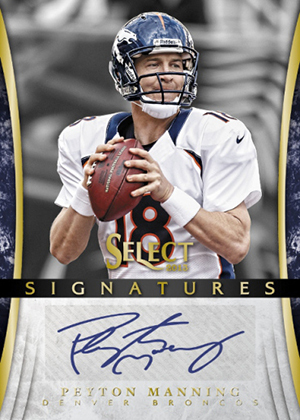 2013 Select Football also has basic Rookie Autographs, which are done with a Black Prizm design. 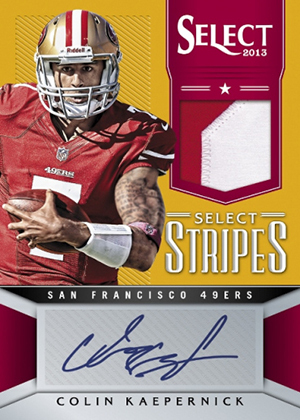 Collectors can also find veteran autographs in both Select Signatures and Select Stripes. Stripes also have a swatch of game-used memorabilia. Select Signatures has Prizm, Gold Prizm and Black Prizm parallels. Stripes have Gold Prizm parallels. Every master box has six basic inserts. Select Greatest pairs players who share the same jersey number, one current star and one retired great. Other inserts include Hot, White Hot and Select in Motion. 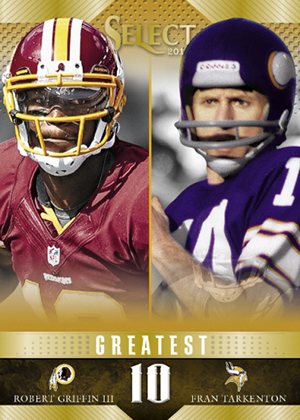 2013 Select Football boxes also boast four regular rookie cards and a pair of Legends cards. 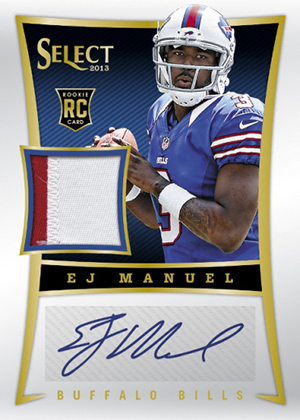 There’s over 86,000 rookie autos in this set, seems flooded to me. Bought 5 master boxes. Got a lot of no name rookies. Not one decent hit. That sux rob. I didn’t buy into this set seeing what would be the outcome. I really like this set I got a le’veon bell redemption and it only took 2 months to get it. Bought 6 hobby boxes and was very happy got some really great autos including Richard Sherman auto amongst other great players. I’m very happy with these boxes will buy some more.